Can Bed Bug Traps Be Used to Solve an Infestation Problem? Can Bed Bug Traps Be The Answer? The new technology of bedbug attracting pheromone traps is making headlines these days. But could these new traps really work to solve your infestation problems? Bedbugs communicate using special chemicals called pheromones. Certain pheromones – called aggregate pheromones – send a signal to bugs after they’ve finished feeding to return to a certain spot for refuge. Replicating aggregation pheromones produced by bedbugs, a special, six chemical blend has been synthesized which both attracts bedbugs – and compels them to stay put. The synthetic chemical blend in the trap is being marketed for those experiencing light to moderate bedbug infestations. 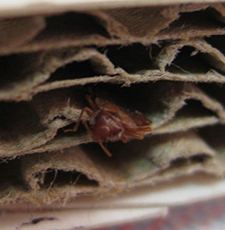 Attracted to the traps, bedbugs can be isolated, killed, and discarded. Could this really be an end to your bedbugs? Yes and no. Though the trap is highly effective, it only takes a single female to begin an infestation, so unless you capture every last bug in the building, you could be hitting the “instant replay” button. The new traps are expected to be a great tool in the fight against bedbug infestation, however due to the pervasive nature of the pests, they will not be a once and done, one-size-fits all solution. You should expect to employ multiple methods to ensure effective eradication. Ready to see the all-clear signal in the fight against bedbugs? End the battle now. Contact Stern today.